3 What is an Accelerometer? 5.1 What is Ultrasonic Sensor? 5.2 How does HC-SR04 Ultrasonic Sensor Works? In this post we will learn about Tilt Angle & Distance Meter Using Accelerometer & Ultrasonic Sensor with Arduino. We have used ADXL335 3 axis accelerometer for measuring the angle in 360 degree dimension. Similarly we have used HC-SR04 Ultrasonic Sensor to measure distance up to 400 cm. The measured angle and distance is displayed on 16*2 LCD Display. You can even use ADXL345 Digital Accelerometer with I2C interface. Here we will be interfacing ADXL335 Accelerometer and Ultrasonic Sensor HC-SR04 with Arduino to measure the angle and distance. 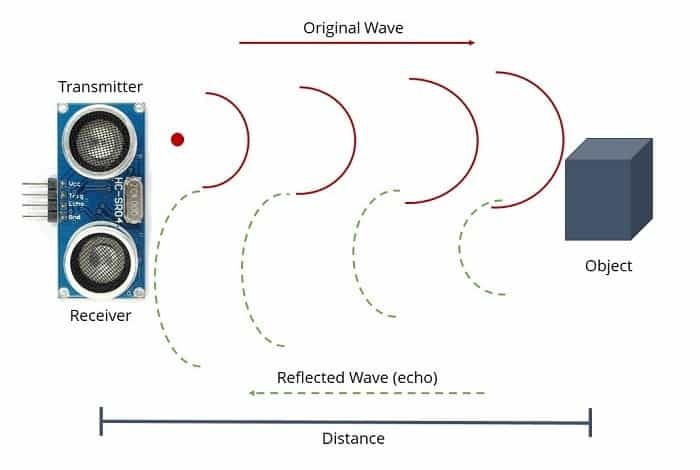 But before getting started you can visit our earlier post to learn more about accelerometer and Ultrasonic Sensor. Accelerometers are devices that measure acceleration, which is the rate of change of the velocity of an object. They measure in meters per second squared (m/s2) or in G-forces (g). A single G-force for us here on planet Earth is equivalent to 9.8 m/s2, but this does vary slightly with elevation (and will be a different value on different planets due to variations in gravitational pull). Accelerometers are useful for sensing vibrations in systems or for orientation applications. This Accelerometer module is based on the popular ADXL335 three-axis analog accelerometer IC, which reads off the X, Y and Z acceleration as analog voltages. By measuring the amount of acceleration due to gravity, an accelerometer can figure out the angle it is tilted at with respect to the earth. By sensing the amount of dynamic acceleration, the accelerometer can find out how fast and in what direction the device is moving. Using these two properties, you can make all sorts of cool projects, from musical instruments (imagine playing and having the tilt connected to the distortion level or the pitch-bend) to a velocity monitor on your car (or your children’s car). The accelerometer is very easy interface to an Arduino Micro-controller using 3 analog input pins, and can be used with most other micro controllers, such as the PIC or AVR. The most commonly used device is the piezoelectric accelerometer. As the name suggests, it uses the principle of piezoelectric effect. The device consists of a piezoelectric quartz crystal on which an accelerative force, whose value is to be measured, is applied. Due to the special self-generating property, the crystal produces a voltage that is proportional to the accelerative force. The working and the basic arrangement is shown in the figure below. How does HC-SR04 Ultrasonic Sensor Works? Here is a circuit diagram for Tilt Angle & Distance Meter Using Accelerometer & Ultrasonic Sensor. Assemble the circuit as shown in the figure below.